31 Days of Halloween '17 - Day 18 - "ParaNorman"
Every now and then I like to stray away from the horror to some more Halloween-y stuff like Hocus Pocus. This year I figured a prime candidate would be a Laika film that I don't really hear too much about these days. It seems to have kind of disappeared a bit and I wanted to bring a little attention to it because...well...it's damn good. It's one of those movies that unfolds in such a clever and satisfying way that you want to watch it again the moment its over. It may just be my love for animated movies but there's a certain quality that Laika brings to the table that is really only matched by Pixar. They manage to handle the material in a way that's both adult but not too scary for the kids. 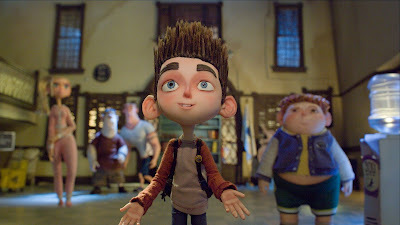 The voice cast is also really great with Kodi Smit-McPhee, Leslie Mann, Jeff Garlin, Anna Kendrick, and Casey Affleck. Seriously, look at that cast. I'm really surprised that this movie didn't do better than it deserved. As someone that is completely obsessed with horror movies, I can only imagine how head over heels I'd be for this movie as a boy. It really hits that young horror fanatic chord. 31 Days of Halloween '17 - Day 10 - "Jack Frost"
31 Days of Horror - Day 23 "Evil Dead"
31 Days of Halloween '17 - Day 31 - "Jigsaw"
31 Days of Halloween '17 - Day 29 - "Jason X"
31 Days of Halloween '17 - Day 26 - "Residue"
31 Days of Halloween '17 - Day 25 - "Ghost Team"
31 Days of Halloween '17 - Day 22 - "Coraline"
31 Days of Halloween '17 - Day 20 - "Halloweed"
31 Days of Halloween '17 - Day 17 - "Blood Rage"
31 Days of Halloween '17 - Day 12 - "Stagefright"
31 Days of Halloween '17 - Day 11 - "The Witch"
31 Days of Halloween '17 - Day 9 - "Infestation"
31 Days of Halloween '17 - Day 8 - "The Ring"
31 Days of Halloween '17 - Day 7 - "Get Out"
31 Days of Halloween '17 - Day 6 - "Backcountry"
31 Days of Halloween '17 - Day 5 - "Man Vs"
31 Days of Halloween '17 - Day 1 - "It"